If you’re going to shell out the cash for a smart phone and data plan, you might as well harness some helpful personal finance applications to recoup some of that money! Here’s a look at the best free Android and iPhone personal finance apps. By far the most heavily used personal finance smartphone app is the Mint.com mobile app. Also available for iPhones, this free-to-use application syncs with your mint.com account. With real time access to all of your financial account information in one place, it can prove very useful for on-the-spot budgeting decision making, date of purchase lookup, and alerts to pay your bills on time. 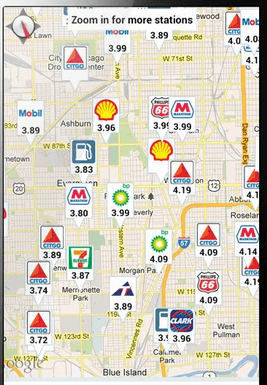 Simply start Gas Buddy, and the app will geo-locate you and sync up with a database that will spit out the gas prices of local gas stations. Select the one you like and use your phone as a GPS navigation to be directed to the station. This app, now also available for iPhone is especially handy when you don’t know where the next gas station is when traveling and trying to decide whether you should get off on this exit, or wait for the next. ShopSavvy was the first bar code scanning price comparison app for the Android, and remains one of the most popular such apps to this day. You basically hold up a bar code, scan it, and then a list of local and online prices are used for comparison to find out whether or not you are getting a good deal. ShopSavvy also lets you set price alerts on items you want to follow. It’s also available for iPhone. OurGroceries (Android) and iPhone) is no ordinary grocery list. You can sync lists with other users so that if, lets say, your husband or wife remembers while at work that you are out of Bell’s Oberon beer, they can add it to the list and it will auto-sync with your shared list (thus avoiding multiple trips to the store). But one of the best money-saving features is that you can save your list for different stores. I highlighted making unique lists for each store you visit as one of the 4 keys to saving money on food and groceries without sacrifice. This app can help you do just that. The Smart Receipts Android app (iPhone here) allows you to take photos, create .pdf’s and monthly expense reports. Valuable for anyone who travels significantly for work, self-employment, or charitable purposes. KeyRing lets you scan all of the bar codes on those rewards cards for the retailers you frequent, shows them on the screen, and the cashier can scan it off your phone. Reduce keychain clutter! The FuelLog Android app almost made my top 5. It allows you to track what you pay for gas, what kind of mileage you are getting. It’s an app that can serve as a real eye opener that you need to cut down on your commuting expenses (or improve your fuel efficiency). Have trouble calculating those pesky tips? TipCalculator takes some of the stress off. Which of these apps are you using for your Android, iPhone, or Blackberry? What are your favorite personal finance apps? What other apps would you add to this list? The 4 Grocers that Stock my Pantry – Where do you Shop? Great list. I just featured your article on RawApps. The top 5 personal finance apps! I’m not sure Mint should be No 1, as far as I’m aware it does not work outside the US. It’s a niche app. I love Mint.com and look forward to using the Android app. I also like your articles on Mint. It probably would have been wise to at least point out that you receive regular compensation from them in your endorsement, as a matter of full disclosure. Not a big deal – it is a great app and a great website. Google finance is one of my favourite stock tracking apps. I love Mint’s cash flow app as well. That deserves a big time mention! Mint.com is useless for non-US residents. What about Easy Money? Why it’s not listed here? @MetAtroN agreed! EasyMoney is definitely the best finance app out there for Android! I’m using EasyMoney and from I see here, EasyMoney should be on the list too. Great post. I just recently got my first android phone (samsung galaxy 2 epic touch) and love it. I like it much better than the iphone and my previous blackberry. I really want a checkbook app to manage my finances that will sync to my wife’s phone as well, but haven’t found one yet. Mint is awesome and I use it regularly but it has a lag time that makes it unsuitable for my main finance app. Thanks for the great list of apps though, I didn’t know about the key ring app until now. Now we have Finance for Android! Good apps! I just want to add to this list free great tools that helping me save money. “Financisto” is a personal finance android app and “Fuel Expenses” easy to use app that let you know the cost of a trip with your vehicle and tracks your fuel mileage over time.